is there only a fast night-bus? Is it better to take the bus or the night train? You can take bus no48: http://routemaster.lk/bus/49/ . The journey should cost Rs1041/- you can book using busbooking.lk You can call 0115 116 117 for more information. From what I’ve heard the train is not particularly comfortable and takes a long time! The highway busses are definitely the fastest and most comfortable. 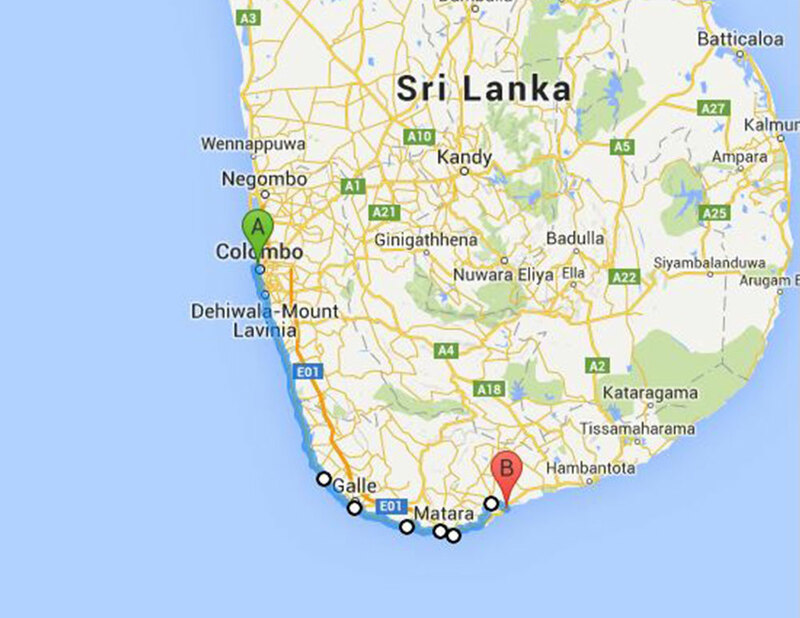 From Matara you can get another bus along the coast, or splash out on a threewheeler! There are airport highway busses into Fort in the centre of Colombo, but you’d have to get to the airport I think. Then from Fort you can get a highway bus, but it’s almost easier to get a theewheeler to Maharagama and pick up the highway bus from there. Hello, I am landing at 28-02-2019 at 3pm – I think I will be at Fort at 4:30om…I wanna go to Induruwa – when does the bus leave? These buses leave frequently throughout the day, you won’t have to wait long. Tell me, please, when will this bus leave Tangalle in the evening so I can be at the airport at 01-00 ? How often does he go to? How much is a ticket? Can I book a ticket in advance? I will land today at 7:30 and take a bus from the airport to Colombo. When does the last bus leave for tangalle from Colombo fort? Can we take this bus from Tangalle to Mirissa without changing in Matara ? What time does the bus leave Marissa to tangalle on Saturday 13 January. Is it possible to take this bus all the way from Colombo to Tangalle? How do I get from the airport to where the bus leaves? What is the timetable for busses on January 2nd? How much does the bus cost? Thank you for answering all the questions!! Hello! How long will take from Bastian Mawatha – Fort to Matara by Bus No. 32/4? Hi, I need your help. We will arrive to Colombo on 20.3.2017 in the evening at 9 p.m. and we will need go to Kumarakanda. Can you help me how we can go to this city and which buses we can use? Sorry for the late reply – did you find your way? Tangalle between 13.00 hours and 19.00 hours. I would like to get off at Hikkaduwa. The bus probably goes when it’s ready! You should be able to get off at Hikkaduwa no problem – but mention it to the conductor. What time do buses leave Tangalle tomorrow between 13.00 and 18.00 hours. We want to go from Tangalle to Hikkaduwa. Thank you. What times does this bus leave bastian?